Craps, as the game of Dice is called, is one of the fastest most exciting of casino games. When the shooter, who throws the dice, is on a winning roll, all the players around the table join in the fun. 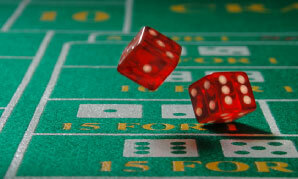 Craps is a noisy, enthusiastic game that offers a thrill all of it’s own. One of the attractions about dice is the clear sense that the player/s are directly involved in making their own luck. Each player takes a turn throwing the dice from one end of the table to the other. The game starts with the first roll of the dice known as the ‘come out roll’. The shooter (person that rolls the dice) must make a bet on the pass line or don’t pass line. If he is on the pass line his aim is to throw a 7 or 11, known as a natural. If he throws a natural on the come out roll his bet will be paid even money, if he throws 2,3 or 12 known as ‘crapping out’, he loses. If he throws any other number, namely a 4,5,6,8,9 or 10, this becomes the shooters ‘point’. In order to win his initial bet, he has to throw his point again before throwing a seven. All the other players can place various bets on the outcome of each roll. At first glance craps is a complicated game, come to think of it at second and third glance it is still complicated but well worth the patience required to master it.